What are the most common Russian words? This vocabulary list gives the answer! You will find these top 100 Russian words everywhere you go in Russia - in everyday conversations, newspapers, books, magazines, on the radio and TV. 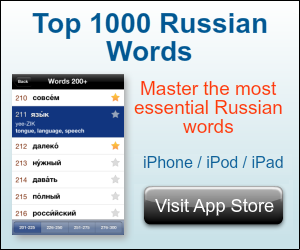 The frequency list provides an opportunity to focus on Russian vocabulary that is essential in most situations. We have included the stress marks and pronunciation of words to help you pronounce the words correctly.